Pulsed eddy current equipment has been successfully applied in corrosion detection for several years now. Whereas field experience on insulated objects has grown significantly, the technique's characteristics make it also highly suitable for other field situations where the object surface is rough or inaccessible. Because (surface) preparations can be avoided the tool provides a fast and cost-effective solution for corrosion detection. An overview of the fundamentals and the RTD-INCOTEST® pulsed eddy current tool for corrosion detection is presented and application ranges are discussed. Several field applications other than insulated objects are presented. 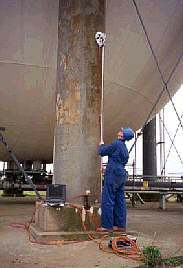 These range from the inspection of port structures and ship hulls to fire proofing, rough or corroded surfaces and coated objects. These spin-offs offer interesting possibilities in many areas of industry such as civil engineering, shipping and (petro-)chemical and oil & gas. Corrosion continues to be a point of attention for the owners and operators of almost all steel structures. Periodic or continuous inspection of objects for occurrence of corrosion or monitoring the extent and severity of known corrosion areas should ensure operation of the installation within the safe zone. 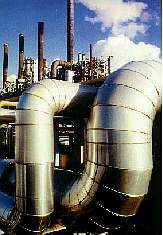 Fig 1: Example of an insulated object subject to corrosion: piping. To operate the installation at minimum cost, new techniques can be applied to minimise the overall maintenance and inspection costs. Such techniques can aim at reducing the total number of activities either by reducing the number of selected areas to look after or by reducing the overall costs per inspected area. The latter, for instance, is possible by reducing the peripheral costs of inspection (preparation, cleaning, access etc.). The pulsed eddy current tool RTD-INCOTEST can assist by bringing down both the number of selected areas and the peripheral cost in several applications. This tool was developed for the detection of corrosion under insulation (CUI). It allows the detection of wall thinning areas without removing the insulation. Using this tool to indicate the affected areas can lead to significant cost reduction. Fewer areas need follow-up and less insulation needs to be removed. Also, in case of asbestos insulation the safety hazards are diminished. Field services with this equipment began in 1997 from RTD’s head office in Rotterdam, the Netherlands. Currently, a network of twelve companies worldwide operate a total of thirty-two systems. These companies exchange experiences on a regular basis and create input in the further dissemination and development of the technique. Their experience with the application of the tool forms the basis of this document. RTD-INCOTEST applies pulsed eddy currents for the detection of corrosion areas. A pulsed eddy current technique uses a stepped or pulsed input signal, whereas conventional eddy currents use a continuous signal. The advantages of the pulsed eddy current technique are its larger penetration depth, relative insensibility to lift-off and the possibility to obtain a quantitative measurement result for wall thickness. This leads to the characteristic which makes it suitable for the detection of CUI: no direct surface contact between the probe and the object is necessary. Also, this tool can be employed in other field situations where the object surface is rough or inaccessible. After a brief introduction of the theory, some of these applications are discussed. The applied operating principle of pulsed eddy currents can vary from system to system. In order to obtain a quantitative reading for wall thickness RTD-INCOTEST uses a patented algorithm that relates the diffusive behaviour in time to the material properties and the wall thickness. It operates on low alloy carbon steel. Fig 2: Principle of operation RTD-INCOTEST. The principle of operation is illustrated in Figure 2. A pulsed magnetic field is sent by the probe coil. This penetrates through any non-magnetic material between the probe and the object under inspection (e.g. insulation material). The varying magnetic field will induce eddy currents on the surface of the object. The diffusive behaviour of these eddy currents is related to the material properties and the wall thickness of the object. The detected eddy current signal is processed and compared to a reference signal. The material properties are eliminated and a reading for the average wall thickness within magnetic field area results. One reading takes a couple of seconds. The signal is logged and can be retrieved for later comparison in a monitoring approach. Fig 3: Display of RTD-INCOTEST showing AWT reading (top left), logged inspection grid (bottom left) and the decay of the eddy currents (bottom right). The area over which a measurement is taken is referred to as the footprint. Probe design is such that the magnetic field focuses on an area on the surface of the object. The result of the measurement is a reading of the average wall thickness over this footprint area. The size of this area is dependent on the insulation and object thickness, as well as the probe design. Roughly, the footprint can be considered to be in the order of the insulation thickness. Due to the averaging effect, detection of highly localised defects types like pitting is not reliable with this tool. This effect is illustrated in Figure 4. Fig 4: Difference between average and minimum WT within the footprint area. Although the average wall thickness reading is not a direct replacement of the commonly used UT obtained minimum wall thickness a quantitative result is obtained that can be interpreted unambiguously. Pipe diameter > 50 mm or 2"
These ranges are determined on condition that a reliable signal can be obtained under regular field conditions. As with any other NDT technique, the pulsed eddy current technique has its own merits and cannot be a direct substitute for an existing NDT technique in an existing NDT inspection program. The characteristics of RTD-INCOTEST result in the application of the tool with various intentions. Firstly, the reduction of surface preparations may be an incentive to use the tool. No cleaning, grinding or removal of coating and insulation is required. Secondly, on-stream screening for corrosion areas can be the objective. This means detecting defects is more important than sizing them accurately. It may be done to bring some ranking in a large number of structures or objects that would otherwise not get any attention because conventional inspection is too costly. Another application can be to select areas for follow-up. For instance, in a pre-shutdown inspection the items that need follow-up during a shutdown can be identified. On-stream monitoring of corrosion areas using RTD-INCOTEST is another approach that is of interest because of intrusion on the process is kept to a minimum. The data of previous measurements can easily be retrieved and compared. Finally, in a risk based inspection approach a choice is made for the level of information required and the necessary certainty for inspection of a particular object. This leads to a choice for a non-destructive testing approach in which pulsed eddy current can be one technique. Fig 5: Application on concrete covered object: support legs of spherical storage tanks. Many foundations in installations, such as skirts of process columns and the supports of spherical storage tanks, are covered with a layer of fireproofing for obvious safety reasons. Small cracks or damages to the fireproofing may cause ingress of water, resulting in corrosion underneath the covering. The deterioration process can not readily be detected from the outside. Failing adequate condition monitoring, the deterioration process may eventually cause the object foundation to collapse with disastrous results. As these fire proofing materials are non-magnetic and non-conducting, the magnetic field can freely propagate between the probe and the object under inspection. Hence, pulsed eddy current can be used to detect corrosion areas without removing the fire proofing material. To obtain a picture of the foundation’s condition, measurements are taken in several points of a defined grid. On the supports of spherical tanks a rapid screening is done by taking readings on four wind directions distanced 100mm-150mm apart axially and starting 300mm from the foot. This results in about 100 readings per support leg. In one inspection day all eight support legs of a tank can be screened and reported. Fig 6: Graphical presentation of results on one sphere leg. All average values measured are presented in a table together with a graph of the results indicating areas of interest for further action. These results can be used for strength calculations indicating the necessity whether or not to take action on the support leg. Again, using RTD-INCOTEST the owners/operators of these structures can find out the current condition in a rapid and cost-effective manner. Many bank-protections, ports and waterworks in areas with a soft soil consist of steel sheet pilings. These sheet pilings have only a very limited protection against the elements. As a result the unshielded steel surface will be attacked by various forms of corrosion. Maintenance including coating the surface is a costly action. The need to create a clean and dry environment below water level, and in the tide zone is, the most expensive . Fig 7: Application: underwater and through marine growth: sheet piling. The conventionally used methods of UT or drilling holes both require extensive cleaning. Because no cleaning is necessary the use of RTD-INCOTEST in this situation leads to a faster inspection. 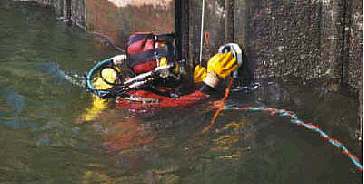 The inspection can be carried out both above and below water level. Based on this result further maintenance can be done creating only localised clean and dry areas. Similar situations occur for instance at risers and the support pillars of jetties. In all these situations both time and money are saved by using the ability of pulsed eddy current to penetrate dirt and marine growth. 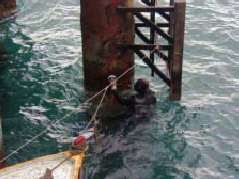 Fig 8: Inspection of jetty support legs. The pulsed eddy current advantage is also apparent in the relatively small lift-off ranges of several millimeters coating material. Detection of wall thinning is possible without removal of coating materials like bitumen, polyethylene or epoxy. Inspections have been performed to follow-up on internal defects detected with intelligent pigs in gas transport pipelines. Coatings not only are used on many pipelines. The classic sailing ship “Urania” of the Royal Dutch Navy was, in careful maintenance over the years, covered with several layers of epoxy coating. Regular UT wall thickness measurements of the hull were not possible without removing all coating layers. 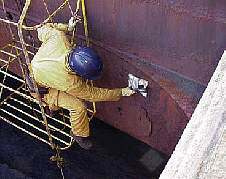 The application of pulsed eddy current to screen for wall thinning saved cost and time, and prevented the ship from damage during sandblasting. 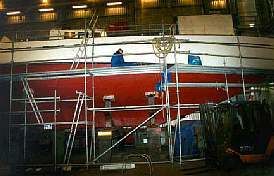 Fig 9: Inspection through coating: the sailing ship “Urania”. Even though the primary objective of inspection can be to detect, monitor or measure corrosion, corrosion itself can hamper the application of an inspection technique. Buried piping without adequate protection will have a generally corroded exterior. Rapid detection of the weak spots on this surface without grinding allows the pipe to be left in operation. This can be quite advantageous for instance if the pipe carries a hazardous product like hydrogen, when grinding is preferably avoided. Fig 10: Inspection on rough, corroded surfaces without grinding. Another application on a ship is developed in the OPTIMISE project. This joint industry project aimed for the reduction of ship survey cost and time for bulk carriers. It resulted in the combination of a magnetic crawler, a video camera and an RTD-INCOTEST probe. The “Marine Beetle” thus composed can inspect the cargo holds of bulk carriers by remote control. The holds of bulk carriers are covered in dirt and corrosion from the iron ore and coal it carried. In this situation the non-contact characteristic of the pulsed eddy current technique allows it to measure on rough surfaces. 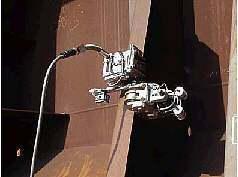 Fig 11: Inspection using a magnetic Crawler ROV: The “Marine Beetle”. Beside insulated objects RTD-INCOTEST proves a suitable application for situations where access to or preparation of the object surface is hampered. The application of this pulsed eddy current technique can be done with several different inspection approaches. Because of its unique characteristics it can play an important role in the inspection strategy or RBI approach of an entire installation. Practical examples have been given for situations where dirt, corrosion, water, concrete or coating material hamper direct surface access. Because (surface) preparations can be avoided the tool can provide a fast and cost-effective solution for corrosion detection. B. Vogel, J. Wolters, F.J. Postema, “Pulsed eddy current measurements on steel sheet pilings”, 9th Int. Conf. Structural faults and Repair, Engineering Technics Press, 2001. C.H.P. Wassink, M.A. Robers, “Condition monitoring of inaccesible piping”, 15th World Conf. on NDT, 2000. J.H.J. Stalenhoef, J.A. De Raad, “MFL and PEC tools for plant inspection”, Insight Vol. 42 No. 2, 2000, pp. 74-77. M.J. Cohn, J.A. De Raad, “Non intrusive inspection for flow accelerated corrosion detection”, ASME Pressure Vessels and Piping Conference, 1997.